What You Need to use TurnSignal on TradeStation. 1. The TradeStation Software Package and an active TradeStation account. 2. The TurnSignal Software Package and an active TurnSignal account. It's easy, just follow the links you need below. Not ready to sign up now? Please Bookmark this page for later. TurnSignal clients may choose to subscribe to the TradeStation trading platform or to fund a "Brokerage" account. 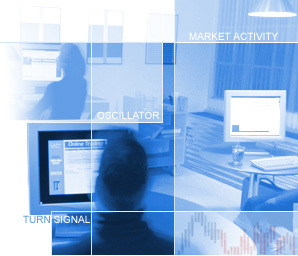 subscription to the award-winning TradeStation software. To receive this valuable benefit($250 retail value), you must be a new TurnSignal user and you must contact us to obtain a special TradeStation "Referral Code". First, download and install the TurnSignal Software. If the TradeStation Software is not installed on your computer you will be provided with a link to request a Referral Code. of TurnSignal and The TurnSignal Indicators. We believe that if you use TurnSignal for 30 days, it will facilitate your decision making and strengthen your personal trading style. Once you have established your TradeStation account, please follow the instructions on the right to register your copy of the TurnSignal software. I am an established TradeStation user. Please read the terms and conditions of the TurnSignal Inc. free-trial offer. Then just click the Download Free-Trial button below. The TurnSignal Free Trial Offer. We are pleased to offer our new clients a 30-Day Free-Trial* of TurnSignal and The TurnSignal Indicators. This is a "No Obligation" trial. At the end of the 30-Day trial period this copy of TurnSignal will simply cease to function. If you wish to continue to enjoy the benefits of TurnSignal after the 30-Day trial ends, all you have to do is go to the "Subscribe" page on our TurnSignal.biz web site to subscribe to a license of the software on a month-by-month basis at US$169 per month. Extended period subscriptions are available at substantially discounted prices. Clicking the button below will initiate a download of the TurnSignal installation package. If the TradeStation software is installed on your computer, you should select "Run" in the Download Security window. Otherwise, choose "Save" to complete the download, and then do the installation after you install the TradeStation Software.